Elijah did really well on the stairs today - he's doing much better with stepping down the steps. 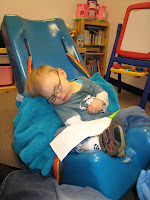 He also worked on gaining strength in his arms, crawled through a tunnel, and did more practicing drinking from a straw. 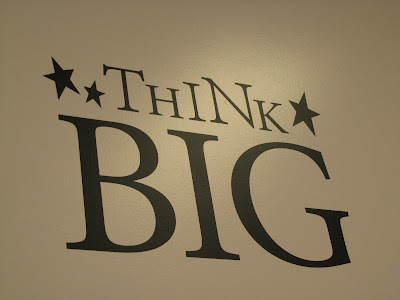 The think big sign (above) is painted on the wall of the speech therapy room and Elijah likes to look at it - always thinking big that boy of ours. 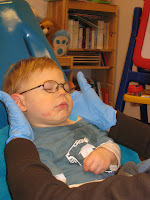 Would you believe me if told you that Elijah fell asleep during speech therapy today? One yawn and he was out. What a funny boy. We're doing well, tired, but well. Almost halfway through week two. I did steps too Elijah... My orientation and mobility teacher had me learn how to use the white can on steps... Then she had me do the steps again, BLINDFOLDED! See how us blind and low vision people do steps! Thanks so much for sharing your posts about climbing the stairs, escalator, elevator. It's really encouraging that you are doing so well as it gives me hope that one day Elijah will be able to flawlessly navigate his world as you do.